Please follow Aquatic Staff instructions at all times. All patrons must arrive in swim attire. Only white, perforated or swim dri-fit t-shirts are allowed on the slides. Absolutely no Speedo thongs, basketball shorts, denim, sweats, wave caps, do-rags, bandannas, or any type of street wear are allowed inside Liberty Lagoon. All patrons are required to wear their swim attire at their waistline. Any offense will result in immediate removal from Liberty Lagoon with NO REFUND. Any child who is not potty trained must wear a special aquatics swim diaper in the pool area. All life vests or jackets must be United States Coast Guard approved. Personal inflatable floats are not allowed in facility. Non-swimmers should put on a life jacket and be accompanied by an adult who can swim. ALL TRANSACTIONS ARE FINAL. In case the facility closes due to inclement weather, unforeseen aquatic circumstances and/or public safety concerns, BREC has the right to cancel reservations. No refunds will be issued. Guests that have been inside the facility for less than 2 hours, will be issued a Rain Check Pass with the original receipt of the current day’s operations. Your safety is our top priority. Youth under the age of 13 must be accompanied by an adult (age 18 or older) at all times. All bags are subject to search prior to entering. No glass, guns, weapons, cigarettes, e-cigarettes, cigars, lighters, or alcohol permitted. No outside food, beverages, or coolers are allowed inside the facility. Some infant items are permissible with approval of site management. No outside balls, fun noodles, inflatable devices, kick boards, or water guns permitted in the facility. BREC is not responsible for any lost /stolen items while visiting the facility. No amplified music or boom boxes are permitted. Do not drink pool water. Abusive behavior, vulgar language, or profanity will not be tolerated. Offenses are subject to immediate removal from Liberty Lagoon with NO REFUND. No running inside the facility, diving into the water is prohibited. Water depths of 3 feet 6 inches are not safe for diving. No chewing gum, smoking, electric cigarettes/cigars, or tobacco products allowed in the facility. No large, organized events are allowed on Liberty Lagoon property without permission or permit from BREC. No pets are allowed in the facility. Service animals with site manager’s approval. No re-entry allowed once you leave the facility. Food and drinks are prohibited in pool water. Minimum height requirement to ride the elevated slides is 48 inches tall Maximum weight limit to ride the slides is 300 pounds. All locker contents will be removed daily from the public lockers at closing. Photos and video may occasionally be taken at the park. Visitors agree to allow BREC to use this media in publications and advertisements. LIFEGUARDS AND MANAGEMENT HAVE THE FINAL AUTHORITY ON ALL SAFETY ISSUES. NO SMOKING ON PARK GROUNDS OR INSIDE THE LIBERTY LAGOON AQUATIC FACILITY. Do not lean, sit, or climb on stair railings while waiting in line to ride. Slide must be ridden feet first lying on your back with legs firmly crossed at the ankles and arms folded across the chest (to prevent elbows from contacting the slide). Never form chains. Single riders only. Footwear is not permitted on this ride. No tubes allowed on this ride. No horse play on the stairs while waiting in line to ride. Swim attire must be worn to ride. No exposed zippers, buckles, rivets, or metal ornamentation allowed. No food or drink allowed on slide or in waiting line. Eyeglasses must be secured with head strap or be removed. No swimming allowed in splash pool. At the end of ride, exit quickly and orderly. Do not run, dive, stand, kneel, rotate, sit-up, or stop in the slide. LIFEGUARDS AND MANAGEMENT HAVE THE FINAL AUTHORITY ON ALL SAFETY ISSUES. OBEY THE LIFEGUARDS AT ALL TIMES! Body boarding, knee boarding or flow boarding on this water wave is a body-active, participatory sport. As with all sports, care must be taken to avoid an injury. Riders must be in good physical condition and free from any medical limitations to participate. Pregnant women and persons with or having a history of heart, back, neck, shoulder or joint problems should not ride. Riders must be 48” tall to body board (lying down/kneeling) and flow board (stand-up). With your wristband purchase the parent/guardian gives permission for youth younger than 18 to participate on the Shockwave in the flow board, body board, kneeling and stand-up positions. Jewelry, hats, footwear, eyeglasses or loose articles of any type are not recommended on the ride as they may injure the participant, and should be removed prior to use. Bathing suit tops, bottoms and loose clothing may be pulled off by the flowing water. Cover-ups are suggested. Enter the ride ONLY after receiving instruction from the lifeguard. BODY BOARDING: Place your body board onto the flow of water slick side down. Lie down on your stomach, head facing the flow of water, with your hips along the rear edge of the board. Your legs should be extended straight behind you to serve as a rudder. Your hands should grab the forward rails of the board. Keep fingers, hands and elbows on top of your board to minimize water splashed into eyes. Gently push into the water flow. You may also ride in a kneeling position. FLOW BOARDING: Holding the nose of the board, place your flow board onto the water flow of water slick side down. Place your back foot approximately at the tail of the board, and position your front foot above the mid-point of the board. Place your weight primarily on your back foot. Gently push into the water flow. Remember– keep your weight on your back foot at all times. Avoid jumping into or entering the ride at high speed and avoid putting weight on your front foot – YOU WILL WIPE OUT! Steer your board into the center of the flowing water section of your side. You can control your board by gently shifting your weight. Try to keep your board pointed in the direction of the oncoming flow of water. Edge control is the key. Keep weight on your back foot! If you wipe out, do not hold your board. Release board immediately, cover your head and keep limbs close to body and try to brace for impact with feet first. Single riding only is permitted. No tandem riders or multiperson riding is allowed in your section of the flowrider. CAUTION! The surface of this ride is very slippery. DO NOT attempt to walk on the ride surface. You may only stand to walk and exit after coming to a complete stop on the dark blue drain grating. Follow instructions of the lifeguard to exit. Horseplay and daredevil stunts are not permitted and will result in removal of your purchased wristband with NO REFUND. 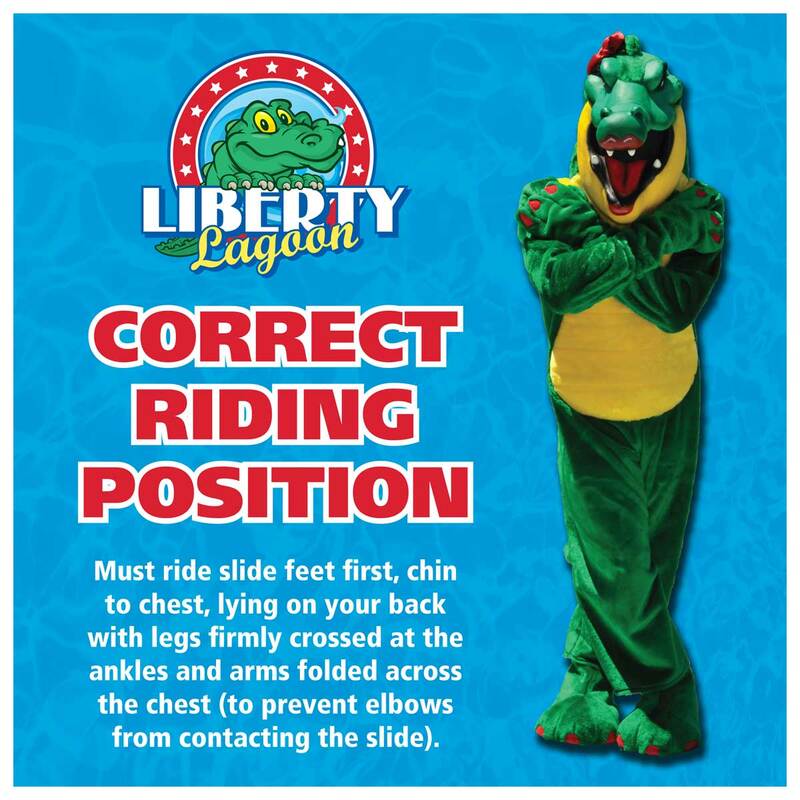 PATRONS ASSUME ALL RISK OF INJURY DUE TO MISUSE OR FAILURE TO FOLLOW THESE RULES OR ANY OTHER RULES STATED THROUGHTOUT THE LIBERTY LAGOON FAMILY AQUATIC CENTER. USE OF ATTRACTIONS ARE AT YOUR OWN RISK. We thank you for your corporation while visiting our Facility.